As a child, there was one thing my mamma made that never left me: hummingbird cake. The moist, delicious cake, slathered with cream cheese icing was something that I couldn’t get enough of. She only made it during the holidays, so it was an extra special treat that I looked forward to every year. Since I could eat my weight in the yumminess of it all – I borrowed her recipe to finally try it for myself. It’s every bit as good as I remembered. However, I didn’t do the three layer cake she always made, I went for my own version with these hummingbird cupcakes with whipped cream cheese frosting. Portion control, people. I have to admit: buying a new stand mixer has turned me into a baking fool. I’ve been making bread from scratch, cookies almost daily, and… well…. anything that’ll let me get my baking fix. It’s a full blown addiction. And I may need rehab. Bake at 350 degrees for 12-15 minutes until a toothpick comes out clean. Makes 36 cupcakes. 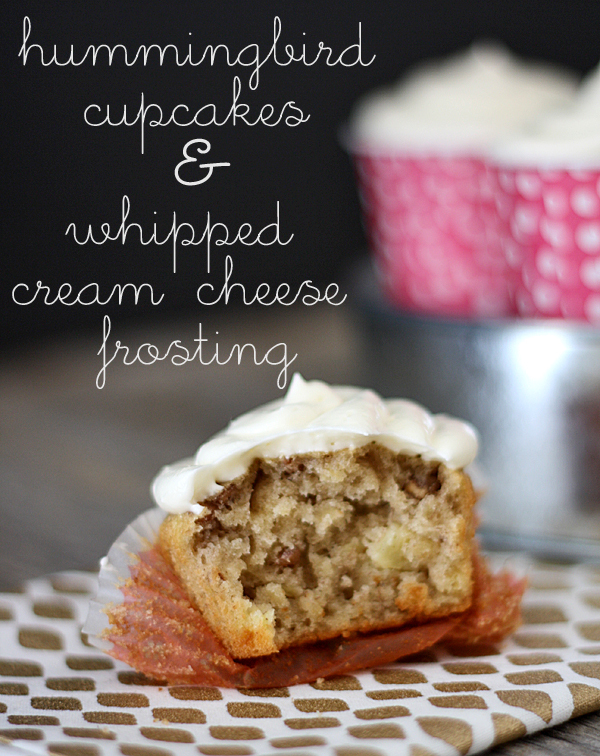 Set them aside to cool and make your whipped cream cheese frosting. In a mixer, with the whisk attachment, put in the bananas and whip until smashed. Add in the pineapple, eggs, sugar, oil, and vanilla. Whip together the butter, cream cheese, half and half and vanilla, mix until incorporated, then whip on high for 2-3 minutes until mixture becomes fluffier. With the mixer on low, mix in the sugar, 1/2 cup at a time until incorporated. 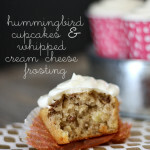 The light and airy cream cheese frosting on top of the rich hummingbird cupcake is out of this world amazing. And… If you’re looking for a food gift, this one is a crowd pleaser every single time. Hey there!!! I am now craving this awesome creation!!!!! You know how much I LOVE hummingbirds…but to have a hummingbird cake (no hummingbirds being harmed : ) I just made the fatal mistake of checking the pantry …you know what? I have EVERYTHING…evan the Pecans!!!!!! I think these just might wind up with my first cup of coffee tomorrow morning! : ) Hugs and thanks for sharing this…I have so wanted to make it forever!!!!! I had my first ever Hummingbird Cupcake this past weekend at Magnolia Bakery in NYC. It was utterly delightful!! May just have to check out your recipe, cuz if it’s anywhere close, I’ll be one happy girl! Thanks for sharing!! Hummingbird cake is one of my favorites. I love the idea of making it into cupcakes! They look so yummy! What size of can of crushed pineapple? Thanks! Oops! Just saw it says 1 cup, not 1 can. Sorry! It’s in the oven now and smells yummy. Thanks for the recipe. I know this is your mothers recipe and I hate to alter it but now that we know Coconut Oil is much better for us than Vegetable Oil, do you think I could substitute it? You can Judy but it does have a coconut flavor to it so will change the overall taste. If you like coconut then go for it! Can this be made in a 9×13 cake pan instead of cupcakes? I need a dessert for a non cupcake crowd. Just found this recipe and can’t wait to try it! Sounds sooooo YUMMMMMY! Hey Cheryl, I hope you like it!! Gina, thanks so much! My late husband used to make hummingbird cakes for us, and this brought back wonderful memories. I’m going to surprise my daughter with the cupcakes!! She’ll cry; I’ll cry, but we’ll be happy. Thanks, sweetheart!